We had our first snow fall a few weeks ago and it looks like it is here to stay. I actually hate the cold and am generally not a big fan of winter. I would miss having snow at Christmas, but other than one snowman making session and a few toboggan rides, I would be fine to skip winter all together. However, in some ways, it is almost a relief when the cold weather finally settles in and the snow is here to stay. I find that transition time in the spring and fall is a killer when you have limited storage space. When the weather is bouncing up and down like a yo-yo, it seems as though you have every coat you own in use and there is no room to house all of the clothes. You know, the light jacket for nice days, the winter gear for the bitter cold and the rain jackets for the very damp and rainy days. Every day seems like a new adventure and in Manitoba that means being prepared for what ever weather happens to come our way. So, with winter here, I was finally able to store all of our fall gear and clear some closet space. I decided to put some of my thrift store purchases to the test and incorporate them into my plans to store our winter accessories more effectively. You may remember my post from last week which highlighted a few of my recent thrift shop finds. I picked up two wrought iron plant hangers. We mounted the larger one inside our front closet door and have it stuffed full of mittens and hats. There are little iron scrolls on the bottom that I slipped some old curtain rings on for our scarves. These are the same rings that I used on the scarf rod in my closet make-over and for the wet mitten rack below. I am so glad I hung onto those rings….they’ve come in very handy! I also purchased a little “welcome” sign for 99¢. I had been planning to make a little place to hang our wet mittens and thought I could use the sign for my project. 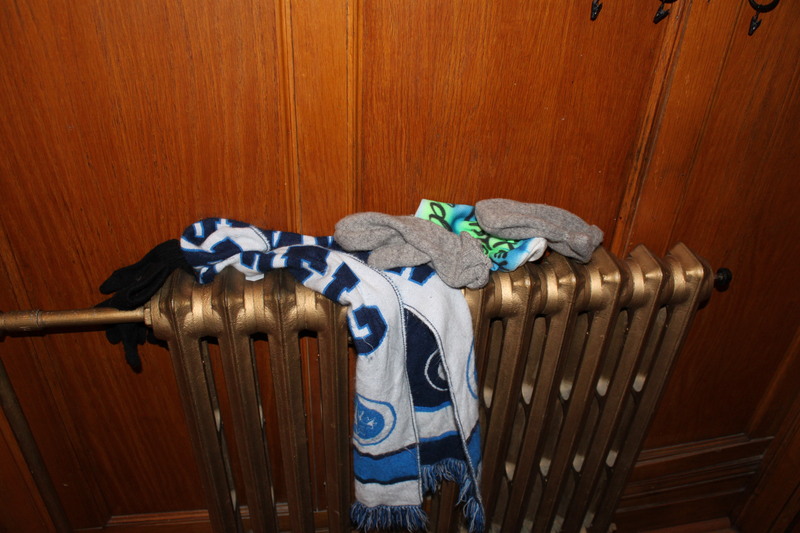 Typically, the radiator at our front door gets stacked with wet gear and is a bit of an eye sore. I thought that a little hanger sitting over top of the radiator would be a bit more visually appealing, but still take advantage of the radiator to dry the wet mittens. This was are previous storage system! I basically took a wooden hanger from the basement (they were left by the previous owners) and sanded it down. It was in good condition, but I wanted it to have a bit of a darker stain. I used some stain I had on hand to create a bit more of an aged look. 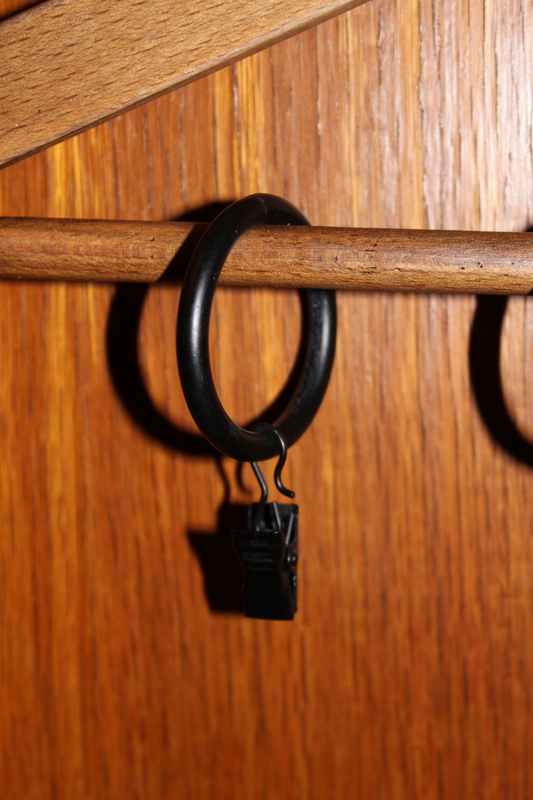 I then gently removed the bottom bar of the hanger and slid on my curtain rings. I hammered the nail back in to secure the bar. I took the little “welcome” sign and sanded it down to reveal some of the wood beneath the paint. I added some stain to the exposed wood and then topped it with a coat of paint. Once dry, I gently sanded the painted layer and applied a bit more stain to distress it slightly. I hand painted the word “MITTENS” and added a few dots to embellish the ends of the sign. Finally, I used some scrap fabric to make a tiny pair of little red mittens to dress up the sign. I used a blanket stitch to finish off the cuffs of the tiny mittens and tied them together with a string, so that they could hang over the buttons I glued onto the sign. Here is a great tutorial for doing a blanket stitch. I love the look of a blanket stitch as it is a simple way to give a project a more “finished” look. You can see that the plant hanger does not provide a neat and tidy solution. It is inside our closet door, so I am okay with the messy look. What I love is that there is an actual “place” for the kids to put their mittens. They can now be held responsible for putting them away when they get home and in turn find them more easily when they are set to go out again. We have not had a chance to try-out the mitten hanger yet, but hopefully this will free up the top of the radiator! Here is a shot of the plant hanger filled with mittens and the scarves hanging below. You can see the hanger is sitting just above the radiator in our front entrance, so the kids can still dry their wet mittens. Posted on December 2, 2013 by Cindy Roy •	This entry was posted in DIY and Upcycling and tagged getting organized, mitten storage, organizing your mud room, wet mittens, winter clothing storage. Bookmark the permalink.